Most treks to Machu Picchu start at Cusco, give your self an extra day in Cusco before starting the Trek, to get used to high altitude. I booked my trek in Cusco and my choices were Inca Jungle Trek or Salkantay Trek. The traditional trek using Inca Trail gets booked months in advanced. 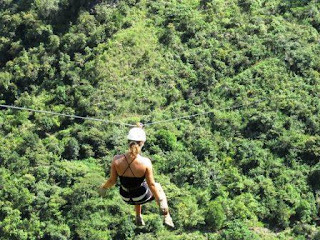 I picked the Inca Jungle Trek as it had Downhill mountain biking, zip lines, whitewater rafting and visit to the Santa Theresa hot springs. Zip lining was extra $$. Day One the tour van was at the hostel early morning to drive us to the Andes mountains, my start of the Machu Picchu Trek was a mountain Bike ride in the Andes mountain, it rained on us and it was freezing. Regardless it was a great great time, once in a life time experience. Get a good slip resistant hiking boots before going on a hike, my advice is to spend the extra money and get a good pair. Break them well before starting the hike. mine and were slip resistant and water proof. I plan to use them on several other mountain Hikes. Hopefully to Kilimanjaro. Besides a change of clothes, a rain poncho, the few other things I carried on the hike was Energy bars, hydrating gels, band aids, flash light and alarm watch. Band-Aids came handy as with all the walking I started to get blisters, nothing to bad though. You can also buy coca leaves and chew on them for energy and they help with altitude sickness. Day 2 - our tour guide put some kind of a henna tattoo on us, the tattoos are washable and they symbolized Inca warriors, Picture below - The Group I was part of that did the trek with me, showing our tattoos. The sheds in the picture is where we stayed the night with a local Peruvian family. Most of the day was spent trekking, with a break for lunch. In the evening it was time for a relaxing dip at the Santa Theresa hot springs. Day 3 - Zip Lining in the Andes Mountains, I did zip-lining across 6 lines in the mountains. Little nervous on the fist one, but by the 3rd and 4th, I let go off my hands. This was day three. We trekked the afternoon to Aguas Calientes. The trek is something that cannot be described, it needs to be experienced, the beauty of the Mountains, rivers and streams along the way. One of my best travels. Day 4 - Stayed the night at Aguas Calientes and next day the Climb to Machu Picchu started at 5 AM. About an hour and a half up the Inca staircase to Machu Picchu. Our tour guide spent a good 2 hours giving a tour. If you have the energy left, I highly recommend doing the Huyna Picchu climb, below me at Huyna Picchu. Awesome view of Machu Picchu can be seen from Huyna Picchu, you will need to book the additional Huyna Picchu trek when booking your Machu Picchu trek as additional ticket is needed. 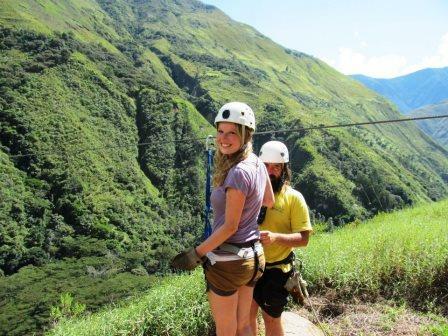 Have you been or planning to go to Machu Picchu, Comments? This is lovely. I enjoyed this post because we are thinking about visiting Machu Picchu next year. Will be saving this post.